What is the Envi High Efficiency Electric Panel Heater? 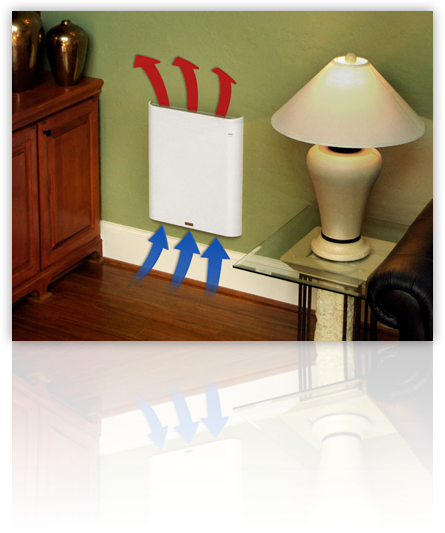 It is a heater that heats a room while using minimal energy efficiently. If any of you have gotten to know me through my blog, you may know that it is very important to me to save money and keep costs low. This heater can really help to do that. To heat a room, it only costs 4 cents per hour. It is wall mounted and comes in white. The model that I reviewed is a new 2011 model. For additional information on the Envi heater that I reviewed, please check out the Envi website to learn more. Sturdy & Crack Resistant – high tech 21st Century durable materials will not crack or seperate at the seams. The Envi Heater is designed with innovative “Stack Convection Technology” that effectively heats a room with minimal energy. The Envi’s inner chamber simulates “stacks” of varying height, which boost airflow through the heater to achieve maximum efficiency. The end result is enhanced airflow at safe air temperature, all without the use of a fan. The Envi heater will provide consistent, comfortable, silent heat without drying out the air or leaving cold spots in the room. My Opinion: For me, there are two perfect situations that I can use the Envi. When I stay at my parent's house, my bedroom is very cold because it is far away from the fire that heats the house and it is over the garage. The Envi heat can cheaply heat the room and keep me warm. Also, my husband and I just purchased our first real home which we are not moving into until April. We are working on the house and the Envi would be great to put in a room that we are working on to keep us warm since we don't want to turn the heat all the way up. Like I said, saving money on energy is extremely important to me and that's why when I saw the Envi, I knew that it would be perfect for me. I would use it in the bathroom it is hardwood floors and is freezing in the mornings. I would use this in my bedroom, which is always freezing!! I would love this! I'm getting married soon, and we need to save all the money we can! I have two daughters who ended up with the coldest rooms in the house. I want one of these- well, actually two. I could definitely use this in my bedroom, it is FREEZING cold! I could use this in my bathroom, it's so cold when getting out of the shower! I would love to have this for my daughter's room. It gets chilly on that end of the house at times! We could use one in so many rooms, but especially in our master bathroom which is freezing all the time since it's over the garage. I would use the Envi Heat in my daughter's playroom that gets colder than the rest of the house. I'd use it to heat up the 2nd bedroom since it's always the coldest. This would be great in my bedroom, it's always so cold! I would definitely use this in our bathroom. I like to have a super warm room when I shower and perform all my 'self-care' rituals. I love that this heater is small and unobtrusive enough to be used just about anywhere, but powerful enough to heat the space you need heated! Our livingroom seems to always be the coldest so it makes the heater run and run and run! It would be nice to keep it nice in here so the heater wont run as much and we can all be warm! I spend most of my day in my home office - I hate to heat the whole house! This would be awesome to help keep me warm during the day! I'd use this in the basement family room. For my freezing cold office at work. This would be perfect for our basement. It's always chilly down there so we don't use it much. I would use this in whatever room needs heat. I reside in Hawaii and we do not have heaters, and I live high on a mountain and believe it or not it gets cold ! I would love it for the bathroom to replace the old built in gas heater. I would use it to keep my office warm in the winter. I would use this in my bedroom-it's so cold in there. My dad would love that! We have a very old house, so there are areas that are difficult to heat. This would be perfect. Definitely in the bathroom. I hate having to heat the whole house just to avoid getting goose bumps while shaving in the shower. I would use the Envi in our "meat-locker" bedroom! I would love the Envi Heat for either the bathroom or the bedroom...both are cold as an "ice box" and the fanless, convection heat and lowered heat bill would be a welcome relief from the cold. I live in Alaska and winters are harsh. I could use this in the bathroom or bedroom area as these are the areas that get really cold. I would use this in my son's room which always stays cold. I would use this in the bedroom to help cut heating costs! And encourage actually getting out of bed in the morning. We would use it to heat the bathroom before showers/baths and the kitchen in the mornings when it is so cold when you first get up. I think we would use it during the day as well in whatever room we are in. It'd be great for the kitchen, it gets cold in there at night! i'd use this in my bedroom! Our master bedroom is always cold in the winter. And I would love to have the Envi Heat to put that room. I could really use it in the spare bedroom we use as a home office. I would use it mainly in the basement laundry room, it gets a little chilly down there in the winter! Thanks for holding such a great giveaway!! our house has a heater but one of my roommates does not like turning it on so i sit here in my footie pjs and freeze. my room doesnt get direct sunlight so it never warms up in the winter. i sleep with 6 blankets! I would use the Envi heat in my family room because there is a draft from the fireplace that sometimes makes it cold. I'd use it to warm the living room, It gets colder than the rest of the house. I would like this for our basement. Our basement family area is quite cool int he winter and I would use it there. Can this heat a big room or would we need more of these. Thanks.